We were approached by a local architect and asked to produce a balcony railing for the bar and restaurant; Public House 49 located on Main Street in Patchogue, NY. The design chosen was loosely based upon an Art Deco styled railing panel which was originally exhibited in the Exposition Internationale des Arts DÈcoratifs et Industriels Modernes, held in Paris in 1925. At the time, this was an extremely important cultural event and brought Art Deco design into the forefront. We were extremely excited to have the opportunity to build a railing of this level of beauty and refinement. We were approached by the Town of Riverhead Alternate Transportation Committee to design and build a decorative archway and gate for a busy alleyway located on Main Street. This project was sponsored by the Cornell University Cooperative Extension of Suffolk County. The goal of this project was to block off the alleyway to automobile traffic while promoting a visually interesting downtown environment that encourages pedestrian traffic. One of the more common requests that Spirit Ironworks, Inc. receives is for textured metals in various thicknesses and sizes. The possibilities for this material are endless. They can be used as decorative panels, signs, range hoods, railing panels and table tops. These textured metals impart a hand crafted sensibility and an interesting detail to both interior and exterior metalwork. We were approached by a private building company with the request to restore and refinish a pair of antique entry gates. These beautiful turn of the century style gates have stood on the grounds of the now landmarked Southampton Arts Center (formerly Samuel L. Parrish Art Museum) building since its original construction in 1897. After viewing the gates, we knew that it would take our unique expertise to restore them and stay true to their original historical integrity. We were commissioned by Larkfield Manor, a catering hall located in Northport, NY to construct a decorative wrought iron canopy for a custom made wood pergola. The idea was to enhance the wooden pergola so that their courtyard would be an inviting place for wedding ceremonies and cocktail hours. The foot print of this structure was 21' by 16'. We were approached by a client with the request to produce 6 replicas of this 17th Century German Folk Art chandelier. It was determined that the chandeliers were to be forged from genuine wrought iron using traditional metalworking methods. This was done to duplicate the texture and feel of the original piece. One of our recurring clients, Ralph Lauren, Co. approached us to see if we would like to create an Art Deco styled coat rack. They presented us with a photograph of a hand forged coat rack and umbrella stand as inspiration. This was to be part of their upcoming holiday window display at their flagship store located on Madison Ave. The results were striking. In 2015, Spirit Ironworks, Inc. was approached by The Patchogue Community Development Agency and The Greater Patchogue Chamber of Commerce with the request to design and build an artistic archway for the Patchogue community. The arch would be an addition to an already renovated Roe Walkway which had been designated as the pathway connecting arts within Patchogue as stated by its local mayor, Paul Pontieri. Spirit Ironworks was approached by a local client who wanted to have her 19th century antique fencing restored. The ironwork, located in Historic Old Field on the North Shore of Long Island, was badly damaged when a large tree and other debris fell on it during hurricane Sandy in 2012. 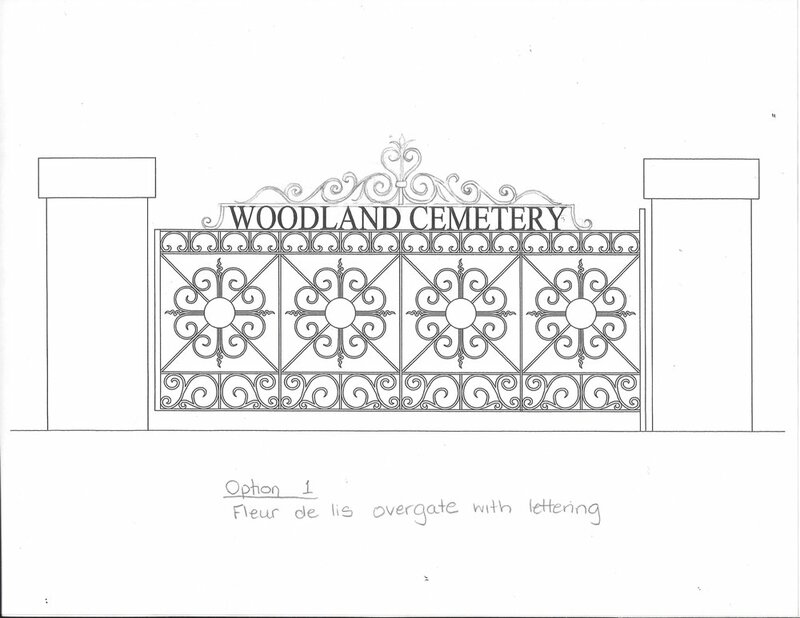 After winning a design competition for a custom one of a kind sculpture for the village of Bellport(LINK), Spirit Ironworks was commissioned to perform a complete restoration and improvement to the Woodland Cemetery Gate. After over a century of service this well-crafted piece of ironwork was in dire need of restoration. Constructed before the invention of electric welding, every joint was either riveted or screwed together. Over time rust has crept into these joints and pushed them apart or completely disintegrated them. After recognizing the level of work that Spirit Ironworks was able to accomplish with the sculpture, the Village knew Woodland’s Gate would be in good hands. We were approached by a client who wanted a set of nature influenced entry gates for her estate in Sag Harbor, NY. She was inspired by a gate design that she had seen while traveling in the Netherlands. Although beautiful, the original design was lacking in depth and detail as it was just a flat graphic cut from steel plate. Our designer felt that a more fully developed composition could be created by forging the leaves from solid material. Forging gives iron a lively and vigorous surface that is not possible by using welding and cutting alone. After redesigning the original pattern, a hand rendered drawing was presented and approved by the newly excited client. The sheer beauty and character found throughout New York City’s architectural and ornamental structures are undeniable. One needs to look no further than the sidewalks of this iconic metropolis to experience its formative charm and historical significance. One of the greatest privileges we as craftspeople receive, is when we are given the opportunity to restore and preserve some of the city’s historical ironwork. An example of such a project was the restoration of this 120-year-old exterior ironwork found outside a land marked building in Lenox Hill. 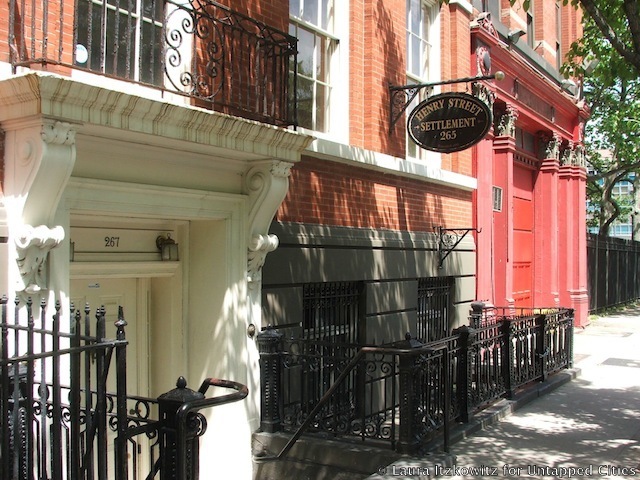 We are thrilled to present PT-I of the Henry Street Settlement ironwork restoration case study. This is a project that we are currently working on at our studio in Bayport, NY. This essay details the restoration work completed for 1 of the 3 addresses that house the historic, Henry Street Settlement.